A 10-minute drive from Miyako Airport. 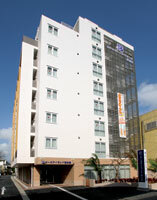 It is located in the center of the city, easy to moving to the tourist attractions of the island. Restaurant, souvenir shop, convenience store, bank prime location within walking distance. Enjoy the gourmet of Miyakojima without worry about the time. All rooms Internet connection Free, washer-dryer, microwave, etc. You can use the care of marine leisure, since there is also a diving equipment washing place.